Geology Drift over Five Yard and Middle Limestone Strata. Record Name Harkerside Pastures seen at snow melt. 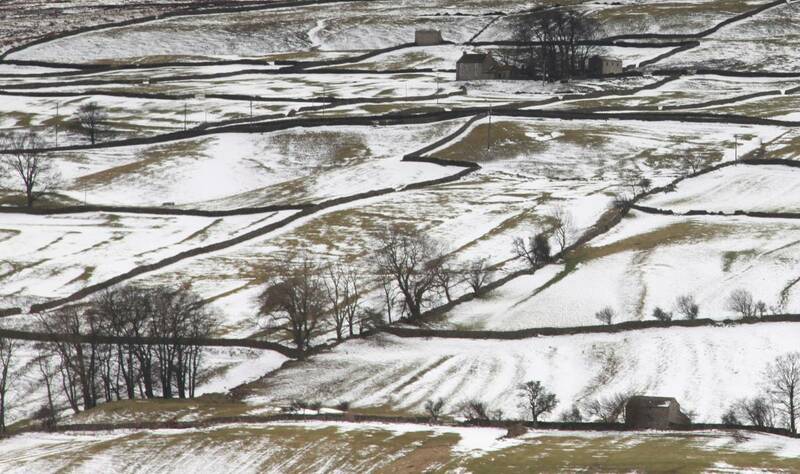 Record Description This Record of the Harkerside Pastures under melting snow conditions is based on two cropped images from a photograph of a greater area hich was taken on 14th March 2013 by Edward Parker, Photographer and Author of 'Photographing Trees'. 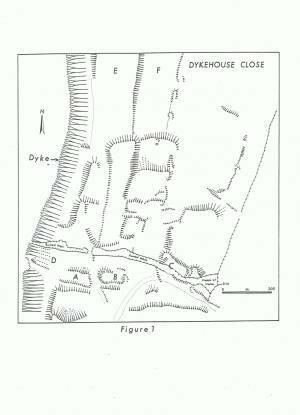 The first of these images is centred on the early settlement on the eastern side of the western of the two linear earthworks, at Dyke House Close. The second image is a cropped and further slight enlargement of the Dyke House Close area of the same photograph. Careful examination of these images will reveal a great deal of the detail of the complexity of the palimpsest of archaeological features within the Harkerside Pastures, including, at the lower right of the photographs, a second settlement core with rectangular structures, located in the lower pastures to the west of the western dike, at Whitbecks - SD03509853. 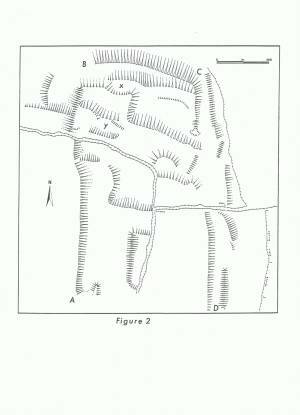 The measured survey plans of both settlements are also attached to assist with the interpretation of the photographs. 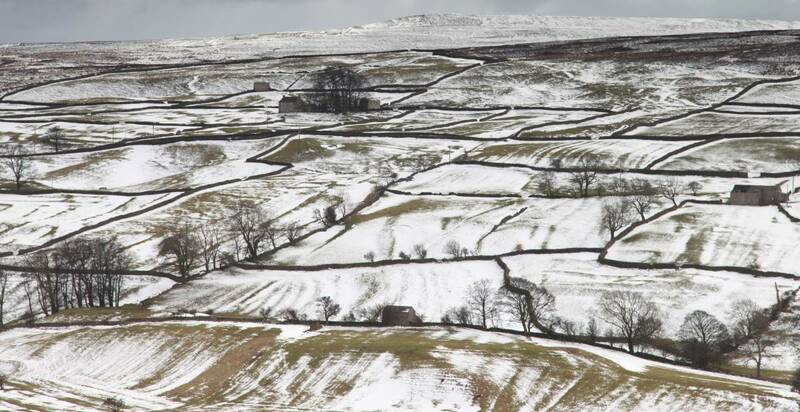 For a detailed description of these settlements, see the Swaledale Ancient Land Boundaries Project Interim Reports for 1992 (No 9) and 1993 (No 10). 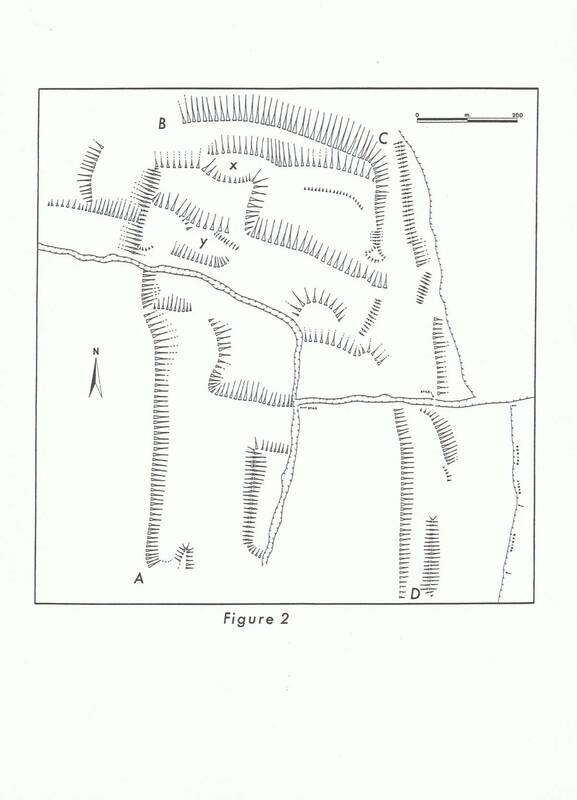 The photographs also show embanked and lynchetted field boundaries of different periods and of great interest,several rectangular structures scattered across the pastures which are best interpreted as of medieval date and representing the Medieval Settlement of Hercay. Additional Notes This photograph illustrates the advantages provided in photographs taken of earthwork features under optimum conditions of low winter sun and melting snow. It is suggested that SWAAG Members take advantage of the conditions afforded to them for landscape photography, when the current snows finally thaw. Image 1 Description Harkerside Pastures photographed by Edward Parker. Settlements at Dyke House Close and Whitbecks seen under snow melt conditions together with field systems and scattered rectangular building bases within the Pastures. Image 2 Description Harkerside Pastures photographed by Edward Parker. 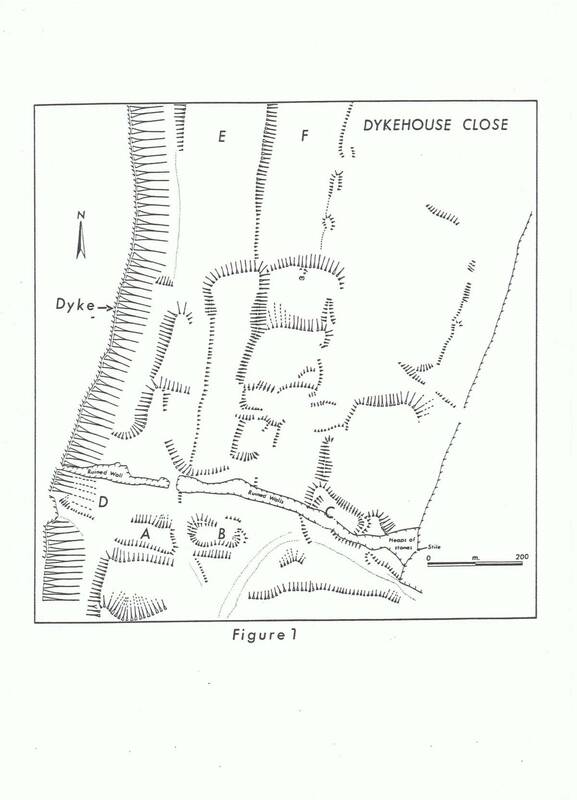 Settlement at Dyke House Close slighted by the western of the two linear earthworks. Image 3 Description Survey Plan. Settlement at Dyke House Close slighted by linear earthwork. Fleming and Laurie: Swaledale Land Boundaries Project Interim Report No 10, 1992. Image 4 Description Survey Plan. Settlement at Whitbecks. 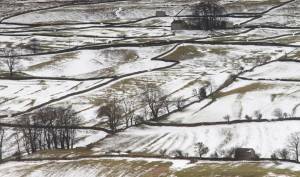 Fleming and Laurie: Swaledale Land Boundaries Project Interim Report No 10, 1992.